After many years of prosperity, the tough time has come for the US shale industry. Dramatic US oil production decline is inevitable and many shale companies face bankruptcy. Their assets can end up to larger producers, reinforcing market concentration. US energy independence can only be saved by government intervention. US government will remove exports limitation and FED September rate hike suspension is related to the unsustainable debt levels US oil industry is keeping afloat. But that is simply not enough to prevent a collapse of the US oil industry. From our research we learn that cost per barrel declined slightly but decreasing production cost is not enough to compensate for lower oil price. 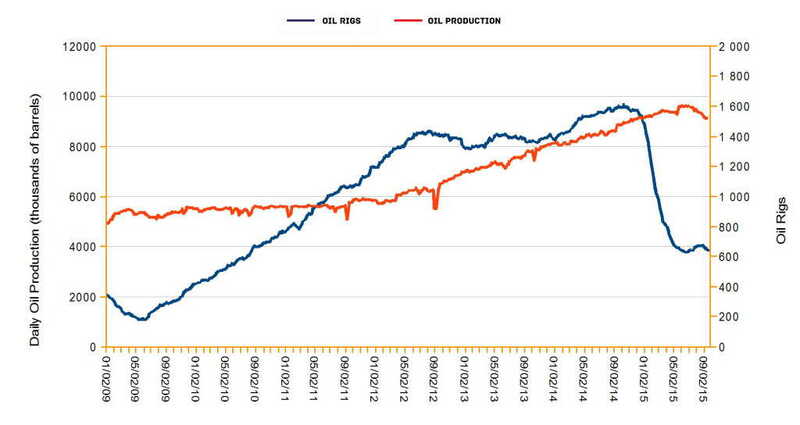 US oil production already declined 400K barrels per day from its April peak. We estimate an other 2 to 3 Million barrels can be wiped out the coming year. A few months ago, when the oil price rise again before the June crush, the US oil industry seemed to be able to go through the difficult times. "It is too late for OPEC to stop the shale revolution", "OPEC can’t stop the shale industry" – roared the headlines. However, after last publications of Energy Information Administration (EIA) the OPEC and Saudi Arabia are the only one to triumph. In July, the EIA projected the expand of US shale supply in 2016, but it had to adjust its estimates to new conditions. Comparing to the first-half of 2014, the US crude oil prices declined by 47%, despite the fact that they passed 60$ in June and were up 40% from their lowest from March’s 43$. The nearest future looks worrying, as EIA forecasts the Brent crude oil average price will rise in 2016 scarcely to 59$ from average 54$ in 2015. Nowadays, the main oil price factors are the economic condition of China and expectations of demand growth in emerging markets. The oil price seems to be closely correlated in recent months to China’s Purchasing Managers’ Index (PMI), which declined in August to 47,3, the lowest level in last six years. Also increased uncertainty of developing Asian countries affected the price. At the same time supply is still going up. There is Iran at the horizon, with looming global crude oil supply. The agreement to ease sanctions will let the Islamic State next year get into the global market with its resources. Added supply could be almost twice as big as the production cuts by US producers. It all together with high stocks is not conducive to price increases. Low prices are forcing American shale producers to cut spendings and reduce output, which reached its highest level in April 2015, but then started to fall as fast as it growth. According to service company Baker Hughes Inc., the number of rigs drilling for oil slumped between October 2014 and August 2015 by more than a half, to 670 down from 1609. In such conditions production capacities are limited. EIA estimates that crude oil production will continue to decrease up to mid-2016. Some growth will resume barely in late 2016, just when the oil price will rebound, but average daily production in 2016 will be still lower by 300 000 barrels per day than in 2015. According to our analyses this estimation is far to optimistic. With rig count back at 2010 level we expect oil production will drop to 2010 levels, that is about 4 Million barrel a day less than the US produce today. This is because of the poor production quality; shale oil wells produce only a very short time oil. The production start to collapse exponentially the moment a new well is in operation. Within 3 to 5 years these wells produce less than 20% of their initial production capacity. The running cost for one well is about 20 dollar per barrel, even with current price enough to keep the well running. To create a well cost on average 35 to 40 dollars a barrel, US shale companies need 57 dollar a barrel. Most of the shale producers do get paid less than spot market prices exaggerated increasing their problems. This is due to transport cost and other miscellaneous market conditions. The financial mainstream-media try to reassure investors that the rig production is going up, but forget to mention that the production per well is going down. This is because producers are now drilling more than one hole per rig. Producing oil has become a little cheaper but that is not enough to compensate for the low oil prices. Industry starts to drop off. In the first half of the year US shale producers lost more than 30 billions of dollars. They are still struggling, but a rise in bankruptcies and restructurings is predicted. Some of shale companies are highly indebted, so they need to pump the oil to gain enough money for debt payments. These producers cannot utilize the advantage of flexibility, as they are not able to adapt the scale of production to current oil prices. Moreover, refinancing debt by taking a new debt on the old one has become more expensive. Interest rates for debt issuance for energy sector are the highest among the entire economy. Even regulators are warning of the risks related to lending to shale drillers, which raised over the first half of 2015 in debt and equity about $44 billion. Shale oil producers can also compensate lower revenues by hedging, what in the first half of 2015 was a great relief, as net hedging assets stood at almost $9 billion for the nearly whole industry. However, many of these hedges, that secure loans, expire soon. Cutting the credit lines by bank can induce a wave of bankruptcies and a great fire sale of shale assets. The probable term of turmoil is October, because then takes place second in this year valuation of reserves that bank use to determine the lending quotas. After re-determinations, some companies will have problem to collect enough money to pay liabilities and capital expenditures. As a commotion comes, our team checked which one shale producer has a chance to remain in 2015 profitable. We analized six big companies, taking their production, revenues, costs and profits from previous annual income statements. Next, we created three scenarios: 40%-, 50%- and 60%-lower crude oil revenues for each of them. We assumed constant other revenues and constant costs at the level from 2014. As a result we gained profits before taxation in our three scenarios, showing if the company was ready for drop in revenues or not. Table 1. 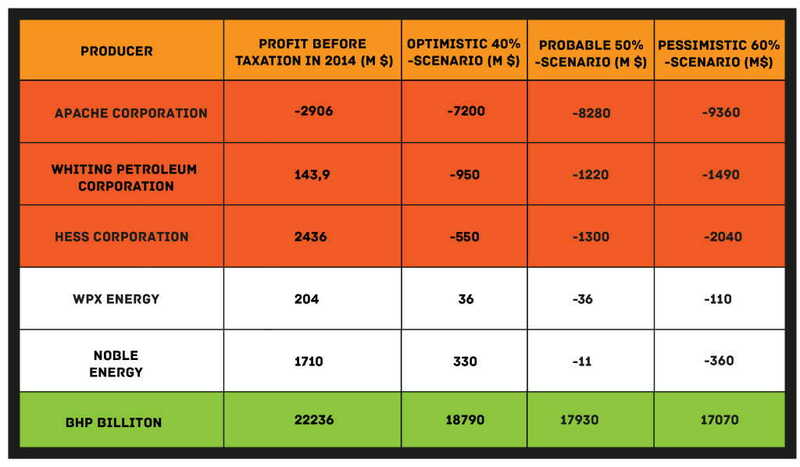 Profit before taxation in 2014 and profits before taxation forecasts for 2015 in 40%-, 50%- and 60%-lower crude oil sales scenarios, assuming constant costs and other revenues at the level of 2014. The numbers say emphatically that most of companies are at the edge, what is proved by latest quarterly financial reports. In the deepest slump is Apache Corporation from Texas, which had already troubles in 2014, finishing with loss of almost three billions of dollars. But the 2015 seems to be even worse! For the first half of the year Apache’s oil revenues are yet lower about 50%, what results in 13 billions of loss, comparing to margin income the year before. An enormous increase of additional oil and gas property and equipment cost is the main cause, though. The only one company still without losses is BHP Billiton, which is not so dependent on crude oil price because of far wider activity, such as copper, iron ore or coal production. Moreover, American shale oil production is only a part of crude oil revenues. One third of them comes from Australia and other countries from different sides of the world. However, the income of BHP diminished clearly in the first half of 2015. The year 2015 will be crucial and could be the beginning of the end of US Shale producers. However, it could be too strategically important for government. The collapse of shale industry means a return to energy-dependence on OPEC-states. As US Census Bureau data provides, since 2011 the share of crude petroleum and natural gas in total US Import have decreased every year, while total import has steadily grown up. Between years 2011 and 2014 general import of crude petroleum and natural gas fell by $84 billion. At the same time, the share of OPEC trade balance in total US trade balance decreased from 23% to less than 10% in 2014. The rescue of US shale industry or shale production could have strategic dimension. One of the possibilities is removing US crude export restrictions. Opening the global market for US shale oil could results in increased domestic production. Removal of restrictions would not have significant influence on global crude prices. Removing export restriction will be not enough to save the industry. Without government intervention the “invisible hand” of the world oil market will simply bankrupt US shale companies and with it destroys the US shale oil industry.